Made to fit like a second skin, HH's Lifa Sport Baselayer Technology garments are figure hugging and perform extremely well in all conditions. I've long been an HH fan, having bought my first set of their thermal undies when I was in my teens. They have lasted so well, they are still on the go and are regularly used in cold weather. The Lifa range is made from polypropylene and the various products tested were exceptionally lightweight and packing down into small balls. Useful features include long length at the back to tuck in and thumb holes in the long cuffs which mean you can protect the upper part of your hands from the elements, handy when you have to take your gloves off. I found the Lifa range to be very comfortable and fast drying. They machine wash at up to 60 degrees centigrade, so you can throw them in with a normal load. 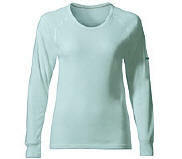 Helly Hansen have long been kind of the baselayer and this range is highly recommended. Prices range from £20 to £30. The men's Dynamic Crew (pictured above) is available in sizes XS-XXL and there are matching fully length pants with fly. The women's Dynamic Crew (pictured above) has an excellent female cut and comes in sizes XS-XL and there are matching three-quarter length leggings. Dryflo is Lowe Alpine's baselayer system, utilising a 100 per cent polyester fabric with inherently hydrophobic fibres. The firm has added a new selection of Dryflo tops for Spring 2003 offering new levels of comfort to the user and improved wicking performance concentrating on the different body 'hotspots' in men and women. Flat seams throughout eliminate pressure points and minimise abrasion, contributing to excellent levels of comfort when you're out and about. We found the Dryflo range to be very lightweight and the technology worked well, wicking away sweat. The stretchy fabric hugs the skin offering a close fit that was comfortable and did not impede freedom of movement. The range is very extensive too and includes traditional tops - long and short sleeved - and longjohns plus sports bras, offering a range of different levels of support, and briefs. You can also choose between crew and zip necks. Comfort, performance and choice make the Dryflo range one you should definitely check out. The Lightweight Dryflo Crewneck (pictured above) is available in men's and women's fits with sizes S-XL. It costs '25. The Women's Lightweight Dryflo Pants (pictured above) are available in sizes S-XL and cost £25. For more info, log on to www.lowealpine.com The Lightweight Dryflo Sports Bra has a multi-panel design and elasticated base band to stop it riding up. It costs '20. We were extremely impressed with the North Cape Rhovyl Therm garments, and not only because they are manufactured in Scotland! The two-layer construction traps warm air in thousands of tiny pockets between the microfilament yarn, helping to keep the wearer warm in extremely cold conditions. There are flat seams for improved comfort and an anti-bacterial treatment which aims to stop you smelling too bad when you get sweaty. The sets we tried fitted very well, thanks to the stretchy fabric which hugs the skin and dried very quickly after concerted activity, or once washed (machine washable at 40 degrees centigrade). Performance was excellent. The range includes a long-sleeved crew neck top (£24), zip turtle neck (£30) and longjohns - called Lonjon - at £22, which have a fly on the male version. Top sizes are S-XL for men and 10-16 for women and colours include midnight, cranberry, grey and heather. The Rohan Warm T is designed to keep you warmer and more comfortable than natural fabrics. It is made from polyester with Dynamic Moisture Control (DMC), which wicks away moisture when you're active and dries very quickly. This is a short-sleeved top with flat-locked seams throughout and a long back to tuck into trousers or pants. It can be worn as a baselayer, or T-shirt and is available in a single unisex design. The fabric feels wonderfully soft and warm and this is another very comfortable garment to wear and one that does its job very well. It is machine washable at 40 degrees centigrade and comes in three colours - lime, black or burnt orange (pictured). The Warm T (pictured above) is available in sizes XS-XL and costs £27. Ladies crew neck top (pictured above) also comes in a very fetching blue camouflage pattern.